We had a really interesting and laid back evening on Wednesday reading through nine new works (a new record!) submitted for our Opus:Testing community composition workshop. 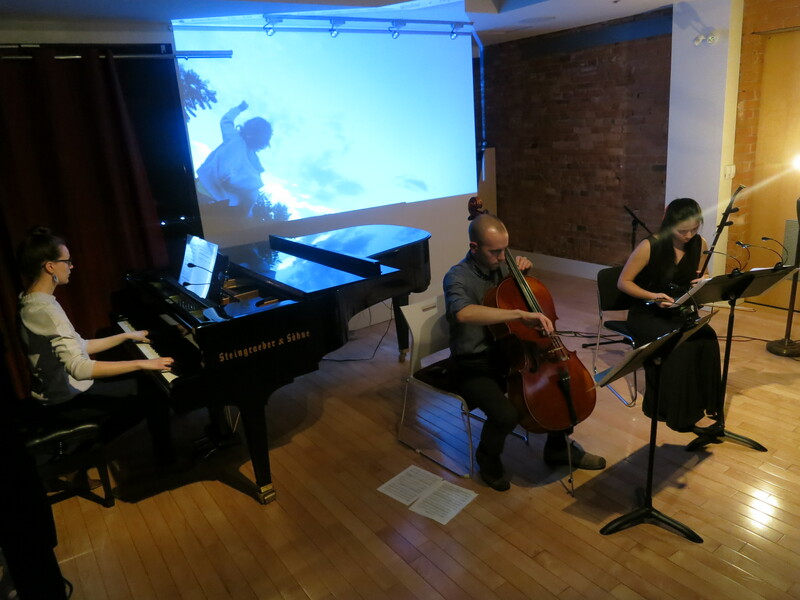 This session’s ensemble consisted of Amely Zhou on erhu, and Musica Reflecta team member Evan Lamberton on cello, and co-director Anastasia Tchernikova on piano. A big thank you to the beautiful and incredibly wide-ranging music from Samuel Bayefsky, Darlene Chepil Reid (joined us live from Thunder Bay), Jason Doell, Jonathan Moir (PhD student in physics), Matthew Tran‐Adams (feat electronic effects for erhu), Nicholas Tristan, Matthew Van Driel (joined us live from Taiwan, early morning for him!) and Humber students Brenden Varty and Adam Filaber. Photographs of their every-day which informed their music were projected behind the musicians. OUR NEXT ASSIGNMENT is a call for remixes of NASA’s public domain space sounds, played with live VHS tape manipulation of your favourite sci-fi films. All are welcome to participate – or join us for the listening session on June 4th!